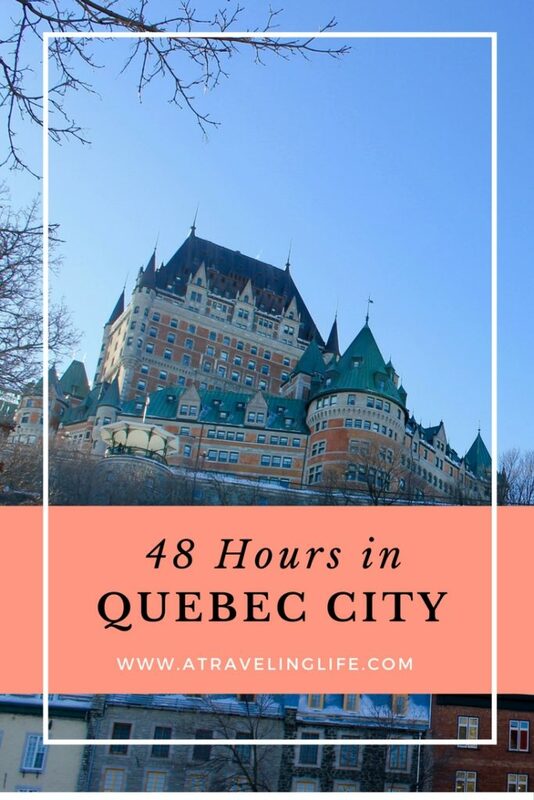 Here’s everything to see, do and eat in order to spend a perfect 48 hours in Quebec City any time of year! We arrived late Saturday afternoon, and the first thing we did after checking into our hotel was add a few more layers of clothing to protect ourselves against the bitter cold. 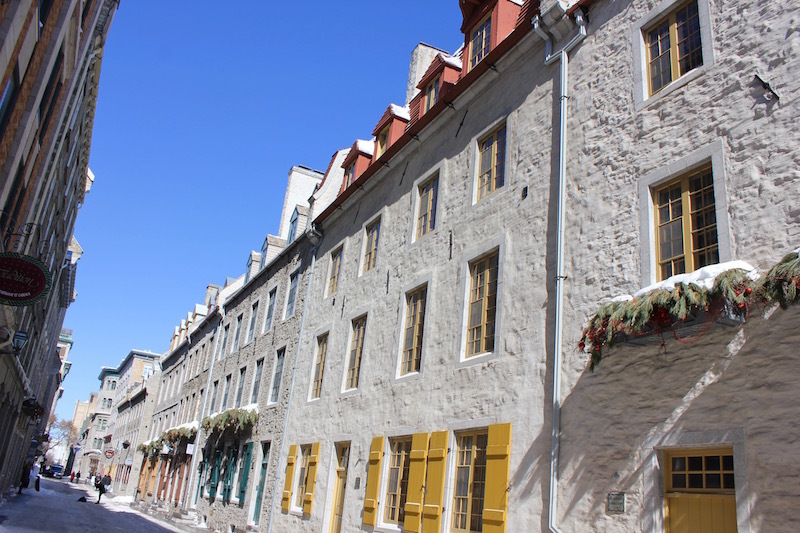 We then set out to explore Vieux-Québec – the walled “Old City” is a UNESCO World Heritage Site – slipping and sliding on snow and ice through the crowded maze of narrow cobblestone streets lined with cafés, galleries, shops, and restaurants. We didn’t get very far, though, before stopping to snap photos of the whimsical signs and brightly colored doors and windows that stood out against the pale stone exterior of the old buildings. Our first stop that evening was the iconic Fairmont Le Château Frontenac, a sprawling luxury hotel perched at the edge of Haute-Ville (Upper Town) that is one of the most photographed sights in all of Canada. Once inside we passed a small circular bar with an impressive lighting display to enter Le Sam Bistro Évolutif. There, we had the pleasure of being served by Nader, the talented Director of Mixology who we learned has frequented some of our favorite bars in Boston. It was hard to choose just one cocktail from Sam’s extensive list, but I settled on the Right Word and was glad I did. Built in the late 1890s, the Fairmont Le Château Frontenac has 611 rooms (!). For dinner, we headed outside of Vieux-Québec to Le Clocher Penché, a farm-to-table restaurant in the hip Saint-Roch neighborhood. I felt like I was in a French-speaking Brooklyn – the dining room featured bright, minimalist décor, and most of the young patrons were wearing flannel. We still were finishing our breakfast at the hotel Sunday morning when a bubbly blonde woman named Margarita of Tours Voir Québec arrived to fetch us for our half-day tour. With the ability to speak six (!) 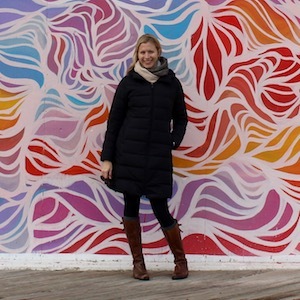 languages – English, French, Polish, Spanish, Dutch, and German – she is a popular freelance guide. She enthusiastically pumped us with facts about her adopted hometown on the way to our first stop, Parc de la Chute-Montmorency, located about 15 minutes outside of the city. At 272 feet, La Chute-Montmorency is 98.5 feet higher than Niagara Falls. The park is a popular destination for hiking, snowshoeing and ice climbing, but the main attraction is the “chute” – waterfall. After checking it out from the bottom, we drove up to the top – you can also take a cable car – and parked at Manoir Montmorency, a restaurant and event venue. From there we traversed a narrow wooden walkway along the cliff that leads out to a suspension bridge over the falls. Standing over the rushing water, shivering in the strong wind, we took in unobstructed views of the St. Lawrence River, Île d’Orléans, the city, and far beyond – all blanketed in snow and ice. Back in the city, Margarita took us to Marché du Vieux-Port, a large indoor market featuring products from nearby farms, dairies and vineyards. My foodie friends and I were in heaven. We sampled cheese from La Fromagère and ice wine from Bilodeau, and picked up a few necessities like maple syrup and macarons. The last activity on our wonderful tour was a stroll around Basse-Ville (Lower Town), during which Margarita mixed in some historical and geographical lessons with a few stops in shops like La Fudgerie, where we, of course, enjoyed some more samples. After spending the majority of the morning walking around outdoors, we decided to up with craft beer, soup and salads at Le Pub St-Alexandre on Rue Saint-Jean. Our next stop was Le Chic Shack for poutine – being a vegetarian, I opted for the perfectly crisped sweet potato fries, while Kristen and Fiona enjoyed the real thing (French fries and cheese curds topped with gravy). Our bellies full of comfort food, we took a ride on the 137-year-old funicular railway from Haute-Ville to Basse-Ville and then hopped on a quick ferry ride to the other side of the icy St. Lawrence River and back. We topped off our very full day with a visit to the First Nations’ community of Wendake, home of the Huron-Wendat people, located just 15 minutes outside of the city. Our destination for the evening was the Hôtel-Musee Premieres Nations, a luxury hotel, restaurant and museum built in 2008 to generate revenue for the community and provide jobs, while educating tourists about the tribe’s history and people. Guests of the Hôtel-Musee Premieres Nations also can enjoy traditional and modern entertainment, as well as nearby activities like snowmobiling and dogsledding. Our guide, Nathaniel, showed us the museum and a few of the upscale hotel’s 55 rooms, which feature minimalist, earth-tone décor and a beaver pelt on each bed. We also got to see inside the traditional longhouse on the property, where you can learn about what pre-contact life was like for the Huron-Wendat and even spend the night (if you don’t mind only a fire for warmth!). Following our tour, Nathaniel deposited us in La Traite, the on-site restaurant, where we enjoyed a flight of cocktails, each corresponding with the characteristics of an animal. We then were served an elegant multi-course meal – I selected mostly vegan options, while Fiona and Kristin, the more adventurous eaters, tried seal and kangaroo while I tried not to look. Read Fiona’s take on our elegant, First Nations-inspired meal. We woke to a fairly hard snowfall on our last morning, but we fortunately got ourselves to the Hôtel de Glace (Ice Hotel) without incident. This is the attraction that drew us to Quebec City in the first place, but since we weren’t brave enough to spend the night, we had to settle for a tour. Fortunately our timing was right – the hotel is only open six weeks every year, from early January to late March. It’s then demolished and rebuilt the following year. The hotel – made by 40 workers using 30,000 tons of snow (!) and 5,000 tons of ice – was larger than I expected, and I was nearly giddy with excitement as we checked out the lobby – complete with an ice slide – then wound our way through the dark and chilly hallways. The 44 rooms ranged from the sparsely decorated – just a mattress on a block of ice – to those with sculptures depicting elaborate scenes of people, animals and nature – everything from ice fishermen to mythical serpents to polar bears. The on-site chapel was absolutely dreamy, with its soaring ceiling and simple ice-block altar and benches, and I know I’ll never again be able to sip a cocktail from an ice glass at an ice bar under a large tree carved out of ice (I’ll share more photos in an upcoming post). The last stop of our trip was a liquor store about a mile from the Hôtel de Glace, where we stocked up on local gin and ice wine – just enough to hold us over until our next trip. If you are going in winter, WEAR WATERPROOF BOOTS. My favorite leather riding boots were no match for the snow, slush and ice that covered most of the sidewalks. I kept slipping while walking up the steep hills, and my socks were always wet. So don’t make the same mistake I made. For more shopping, drinking and dining options, check out Rue Grande Allée and Rue Cartier. You can visit Bilodeau’s cider mill and orchard on Île d’Orléans. Here are some of their ice wines at the Marché du Vieux-Port. We stayed at the Palace Royale, which is located only one block away from the gate to Vieux-Québec. Margarita also recommended Hôtel Le Priori. What are your recommendations for how to spend 48 hours in Quebec City? I would like to thank Québec Region for organizing our stay and providing us with the city tour. I also would like to thank Hôtel-Musee Premieres Nations for the tour and generous dinner, and Hôtel de Glace for the tour as well. All opinions are my own. I would love to travel here! It looks like a beautiful little winter wonderland which is just what I have been searching for. The Ice Hotel seems very novel and I love the idea of it! Quebec looks so dreamy. I don’t do well in the cold, but I think I would give it a shot for those views. I would actually like to spend a night in the Ice Hotel. I think it would be a great experience to sleep on an ice bed (even if it’s really just a regular bed on an ice boxspring). I also think the old section off Quebec City would be interesting to explore. I visited Québec (the province, though, not the city) numerous times in summer. Ice climbing vs. ice cream is no brainer for me – the latter one always a winner when combined with hot sunny days. However, visiting Ice Hotel and tasting Érico’s chocolates look very tempting. Maybe, I should dig up my winter coat later this year and go there. What a fun adventure! You’ve really confirmed our thought that we need to get to Quebec. We had not heard of the Hôtel-Musee Premieres Nations, but it looks and sounds great! Definitely something for our Must See list. Thanks for sharing! I also spent a really good time there but now my Uncle also has a plan to go there in coming up days to enjoy some time with his kids. They are so much excited about this journey. I am so sure that it will be a really great time for them and they will come back with a lot of pleasant memories. I also suggest them that you must explore its interesting places and could make their journey more memorable and interesting. Thanks for reading. I hope they have a good trip! I’m going back in May and really looking forward to it.